Massimo Carozza recorded a hat trick while his Stingers teammate Anthony Beauregard added two goals and four assist on the night. Brandon Kosik also scored in Concordia’s dominant 6-2 win over the University of Ontario Institute of Technology Ridgebacks. “I’m so proud of the guys. Carroza with the hat trick and Beauregard with six points on six goals is huge,” said Stingers head coach Marc-Andre Élement. “We just have to be more disciplined. We can’t allow them to get momentum on the power plays so we need to focus on that”. The opening score for the Stingers was a shorthanded goal late in the first period and while the Ridgebacks were changing. Beauregard slipped through traffic and scored all on his own with 14 seconds left. By the end of the first period, the shots were just eight to seven in favor of Concordia. As the period ended, Raphaël Lafontaine was given a game misconduct penalty for checking from behind. The Stingers would successfully hold off on a shorthanded five-on-three situation and once back to full force, the scoring started again. Beauregard fed a pass to forward Brandon Kosik for his first goal of the season at the 5:15 mark. Just a minute later, Beauregard would feed another great pass to Massimo Carozza to make it a 3-0 lead. The Ridgebacks would get onto the board midway through the frame on a power play by Mike Robinson. But for the second time in the game, Beauregard would score with under a minute to go to make it 4-1 by the end of the period. That was not the end of the scoring for the Stingers however. Beauregard passed it to Carozza less than a minute into the third period to score his second and make it a 5-1 lead. Later in the period, the Ridgebacks lone scorer Robinson would add another goal, but that would be the last of the offensive production from them. Beauregard would once again assist Carroza late for his third goal of the game and his first hat trick of the season. “It was all nice plays by my line mates”, Massimo Carroza reflecting on his hat trick. “All I had to do was put it in. We played a good game”. The Stingers would win this game 6-2 and outshoot the UOIT Ridgebacks 42-33. The Stingers improve to 5-1-1 on the season and into a tie for third with Carleton. 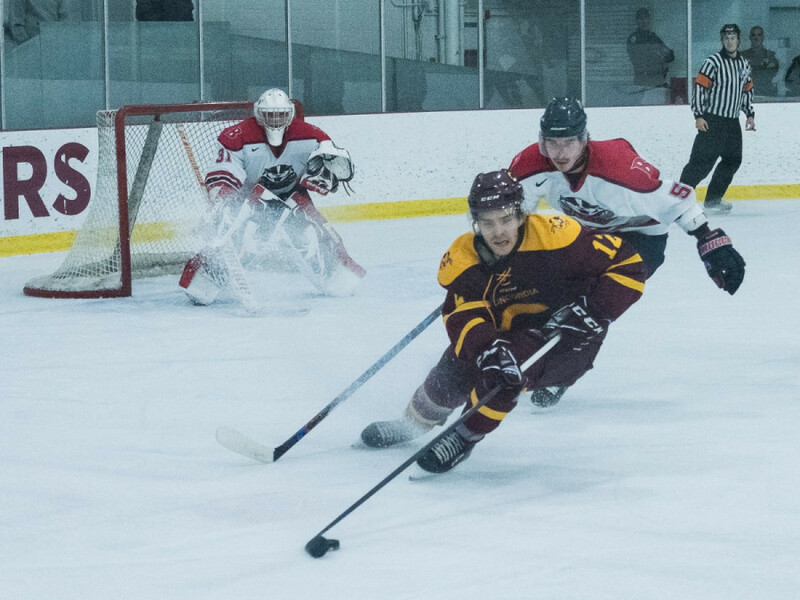 Next game for the Concordia Stingers men’s hockey will be against the Royal Military College Paladins on Saturday, Nov. 4.